St. Louis Rosary Makers Guild was organized in May, 2004. We welcome anyone who would like to learn how to make rosaries to our meetings on the last Tuesday of each month. 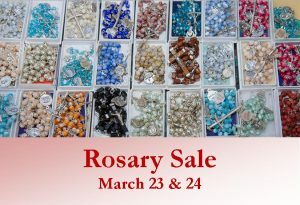 The Rosary Guild will make custom rosaries. If you are interested in this service, call the church office at 901-255-1950 and a member of the Rosary Guild will contact you. Contact Roberta Mills at 901-767-0799.